Last year I turned 40. 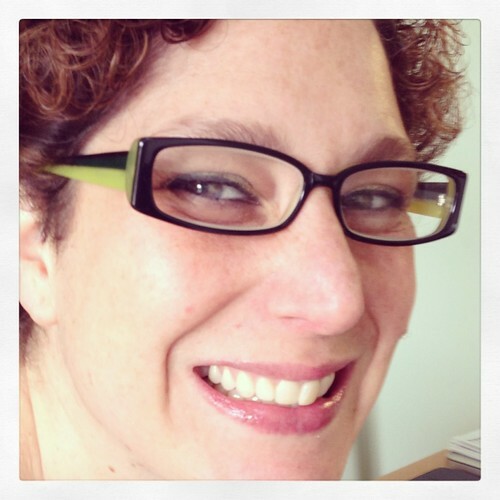 Within three months, I went from having perfect vision to wearing reading glasses. I confess, between loving accessories and being a geek, I was inwardly excited to gain four-eye status at last. I found a pair of black and green glasses that weren't too big for my face, and fit my style well. I mostly wore them at work. On other days, I didn't tend to read enough that some minor blurring on my iPhone was problematic. However, I started having headaches at work by November. The constant on/off and looking up and down from my computer was putting a strain on my eyes. The optician recommended office glasses - like varifocals, but with more space devoted to the reading part rather than the distance part. Since I was about to start maternity leave and doubted how much time I would need to wear them for reading, I decided that I would wait. What I had not considered was that taking glasses on and off all day with a curious toddler and a grabby baby is far from ideal. I read enough that I increasingly need them, but it's impractical to keep changing them when my hands are busy with Junior and Juniorette. I don't like to wear them on top of my head (it stretches them out), and using a chain around my neck is just asking for trouble. And I've noticed that my distance vision is starting to suffer as well. So, it's varifocal time. I was sad to learn, though, that my current glasses are not suitable for varifocals since they do not have enough lens area. My latest obsession, therefore, is online glasses shopping. I had heard of selectspecs.co.uk from mammatwo.com. Their bargain glasses start at £6 (six pounds!) so even if you're unsure about ordering glasses online, there is little financial risk involved depending on the style you choose. I have not ordered any just yet, but I have a tab open in my web browser so that I can keep going back to it. Next, I went to glassesdirect.co.uk. S has ordered two pairs from them and they are good quality and value, especially since his prescription tends to be expensive. They offer a free home trial, and I was keen to try some different styles before committing to any new frames. 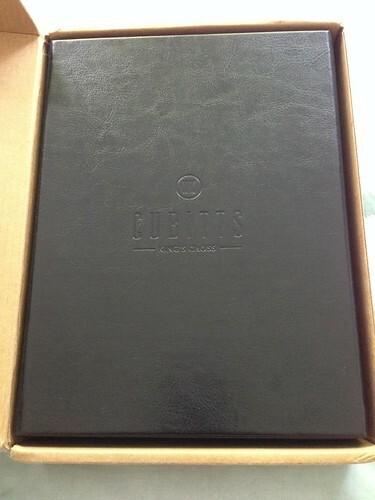 Likewise, I was thrilled to find cubitts.co.uk. 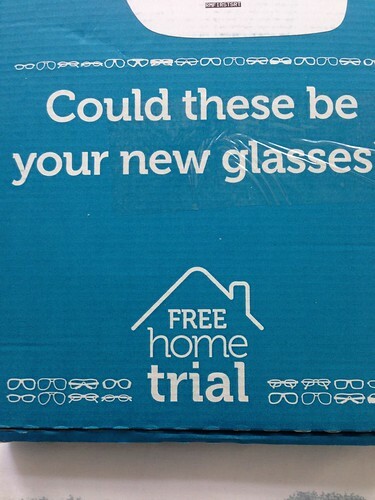 Not only do they offer free home trials, but their look/feel is retro-hipster-tastic. 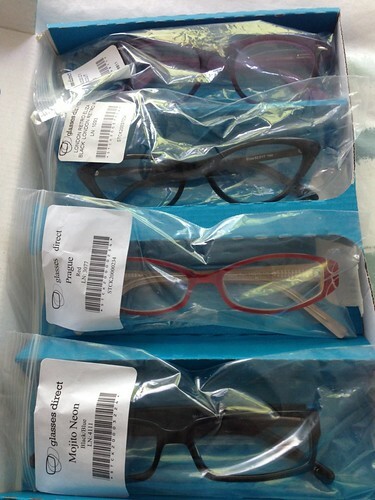 Their frames come in four colours, so I ordered four styles in each of the colours. Ordering a home trial is easy, and cubitts uses collectplus.co.uk for shipping and returns, so you get delivery and returns information by email. The frames have the styles printed onto the arms so you know which ones you are trying. 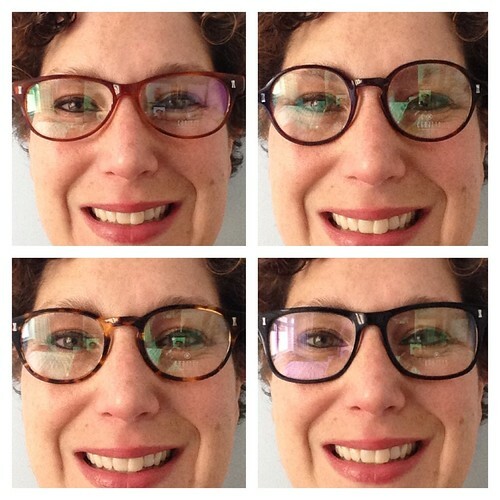 I ordered the Woburn, Marchmont, Wicklow, and Calthorpe frames in amber, dark turtle, light turtle, and black, respectively. Sadly, I'm not retro-hipster-tastic enough to pull them off. The Marchmonts made me look like Harry Potter, and the others were just too big. The Woburns were the best, but I didn't like the colour - I think I'd have to have black frames. But the glasses were more interesting. I chose Scout Marilyn in purple, London Retro Eliza in black, Prague in red, and Mojito Neon in blue. I liked the Marilyn and Eliza frames best. 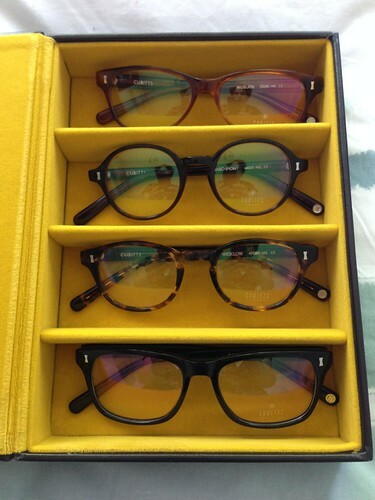 Too bad the Eliza doesn't come in colours other than black or tortoise; I'd love a brighter, bling-ier pair. The Marilyn frames were fine, but I think I can do better. The Prague and Mojito frames were too narrow - similar size to my current ones - so I'm wary of making them into varifocals now that I have been cautioned against that. 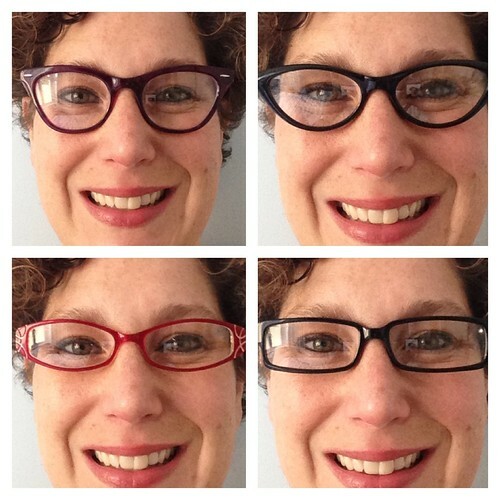 Note: I was not asked to review any of these sites, but since at least one other blogger is currently contemplating varifocals, I thought I'd share my experience so far. I was excited to get glasses when my vision went a bit pants too! The novelty wears off after a while though doesn't it! I've a friend who buys her frames cheaply from ebay and takes them to a local place on an industrial estate to get the lenses sorted out. She says it's the cheapest way to always have new, funky glasses.